Since we last spoke, I’ve spent a great deal of my time testing and revising old and new recipes for the proposal, meeting with friends, and more recently- battling the nightmares of food poisoning (Just mentioning it makes me feel like someone’s going to say, “Kam- TMI.” Sorry.). I won’t go on-and-on about how the past several weeks flew by, as I fear there might be just one too many of those posts in the archives. And I’m definitely not going to whine yap about this entire food poisoning experience and how it’s basically made up my mind (for the time being) on cutting meat entirely out of my diet. Instead, I’d much rather talk about these pistachio polvorones because in the midst of all this chaos, I took a moment to breath and bake something that can banish any bit of stress at 500 feet. These Pistachio Polvorones are something I’ve been wanting to share with you since my visit to San Francisco’s Tartine Bakery back in April. After ordering a few of their utterly perfect (traditional) version of these cookies, I was inspired to share a recipe for my take on these half-spheres of deliciousness. So, after months of putting this recipe on the back burner, this seems like a better time than any to finally share it. Polvorones are a crumbly Spanish shortbread, which are more commonly known as Mexican Wedding Cookies or Russian Tea Cakes. There are many variations of Polvorones, but ideally, a Polvorón is crumbly, not entirely sweet, and is always mixed with some type of nut, traditionally pecans or walnuts. Although a Polvorón is covered in powdered sugar, I feel that it shouldn’t be covered in a dry mountain of the sugar- it just ruins the entire cookie eating experience. I did take some liberties with the concept of these Polvorones (these are far from traditional), as I do nod to the suspected Levantine origins of these latin cookies by using a mixture of Pistachio nuts and almond meal, which I find to be much more satisfying than the traditional use of pecans and walnuts. These cookies, I must admit, do require a bit more handling than most cookies, but I personally find the mindless repetition of measuring and rolling cookie dough in powdered sugar quite relaxing. 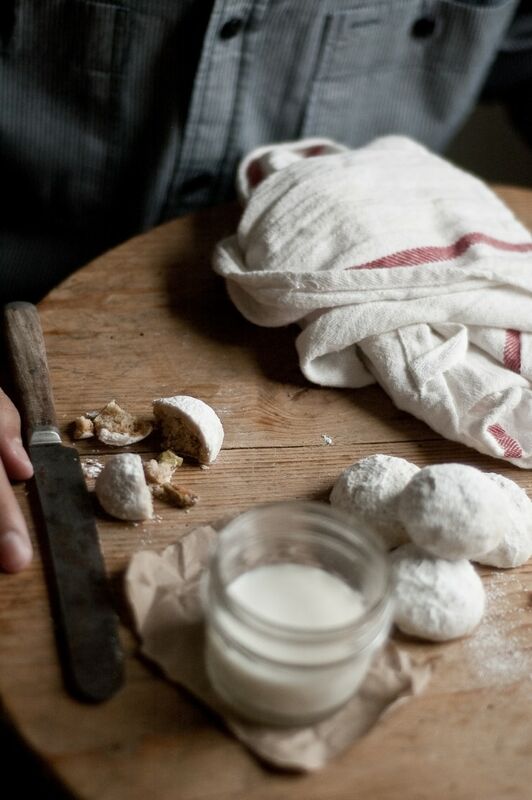 The dough starts off like any basic cookie dough- butter and sugar (in this case- powdered sugar) are beaten until they are pale and fluffy, then a splash of sweet smelling vanilla and almond extracts are mixed in. A mixture of pale all-purpose flour, nutty whole wheat pastry flour, a pinch of sea salt, and a healthy pinch of warm, earthy cinnamon are mixed in. After that, green shards of pistachio nuts are tumbled in along with an aztec mound of almond meal. The bowl of dough is, then, covered and let to set in the refrigerator until cool and firm. 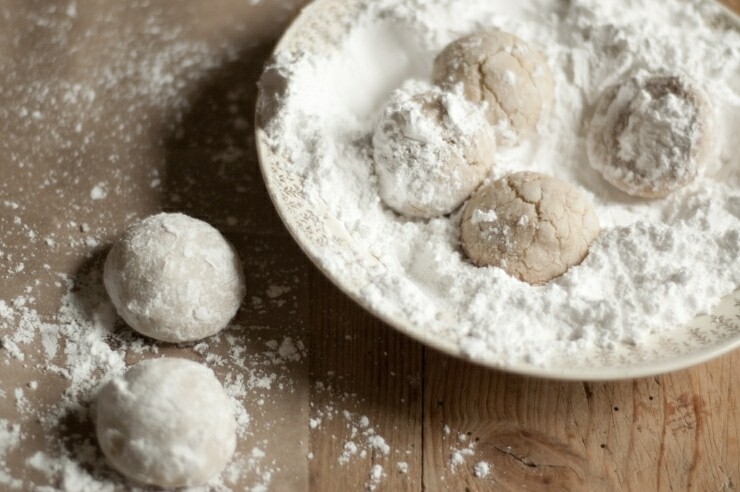 Once the dough has set, tablespoon-sized rounds of dough are rolled in powdered sugar, and then baked until crackly and lightly tanned. The cookies are set to cool and are dusted in another light coating of powdered sugar. Now, I know that all of this rolling in powdered sugar seems like the cookies will be insanely sweet-they aren’t trust me on this. 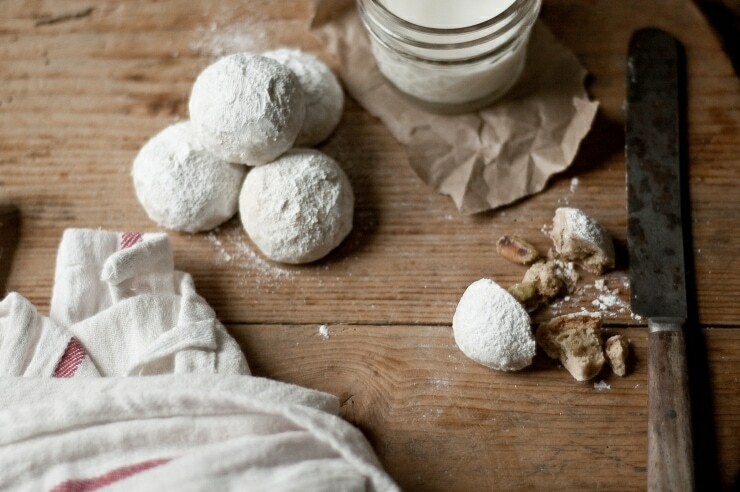 After the cookies have been cooled and dusted in powdered sugar, I usually pile them on a platter, and leave them on the counter for nibbling throughout the day, which I regret to admit is a bad move on my part because they never last this way. The cookies, are perfect as is or served with a cup of warm black tea lightly sweetened and swirled with a slug of milk, or coffee. 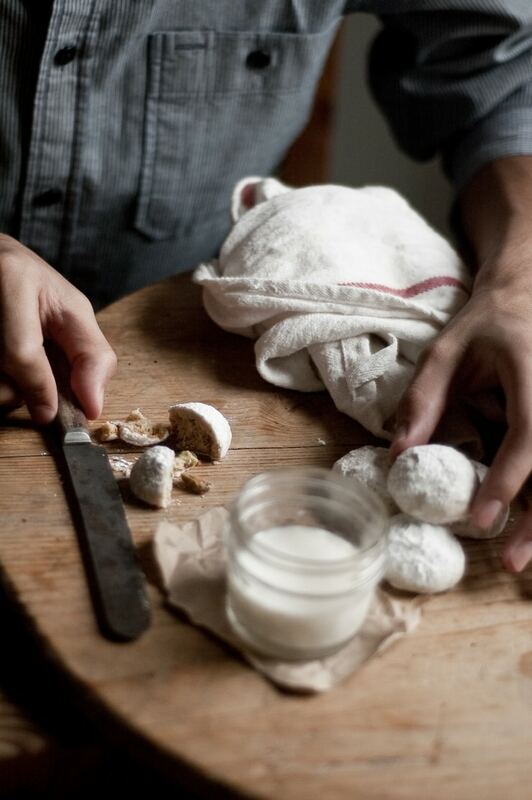 I however, always find a glass of milk to be obligatory when eating most cookies, and these sugar dusted bites of happiness are no exception. I do take some liberties with the concept of these Polvorones, as I do nod to the suspected Levantine origins of these Latin cookies by using a mixture of Pistachio nuts and almond meal / flour, instead of the traditional pecans or walnuts , but if you haven’t any pistachios, I suspect that an equal amount of roasted pecans or walnuts would work in place of the pistachios, or if you prefer- more almond meal in place of the pistachios. These cookies are pretty versatile. I use a combination of All-Purpose Flour, and Whole Wheat Pastry Flour; I do so because the WWPF enhances the nuttiness of the cookies, but you can easily substitute the amount of WWPF with All-Purpose. Make sure to use shelled, unsalted dry roasted pistachio nuts. If you can’t find unsalted pistachio nuts, don’t worry- reduce the amount of sea salt to ⅛ teaspoon (or if the pistachios are extremely salty- leave the salt out entirely). Salt is crucial in the flavor of these cookies, but too much salt ruins the cookies, and too little makes each bite set off a “these cookies need something” alarm. In a large bowl, whisk together the All-purpose flour, Whole Wheat Pastry Flour, Salt, and Cinnamon. In the bowl of an electric mixer (you can use a hand mixer and a large bowl, if you prefer) fitted with a paddle attachment. Whip the butter until fluffy, then slowly add the ¾ cup of powdered sugar (I can’t emphasize the word “slowly” enough- the remnants of powdered sugar clouds are not fun to clean up), and whip together on medium speed until pale and fluffy, about 3 minutes. Add the vanilla and almond extracts, and mix until combined. On low speed, slowly add in the flour mixture until just combined. Briefly mix in the pistachio nuts and almond meal. Leave the cookie dough in the mixing bowl, and cover the bowl well with plastic wrap. Rest the dough in the refrigerator for ½ hour, or until the dough is firm. 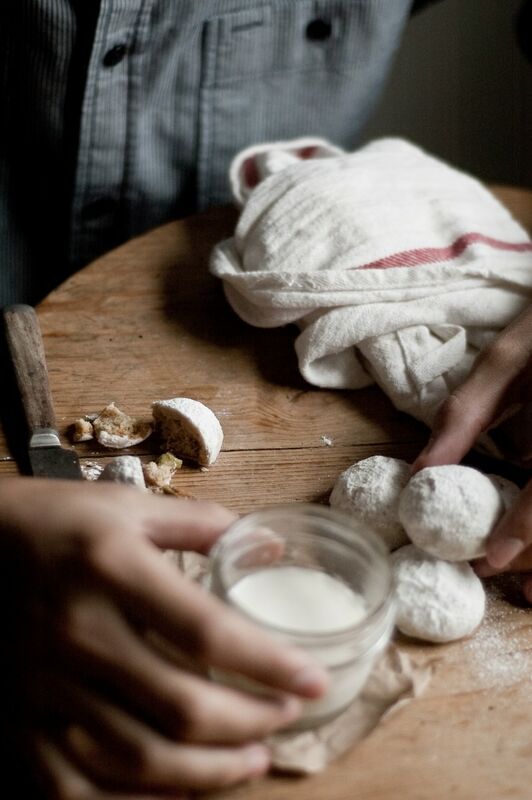 Roll the dough into tablespoon-sized rounds, and coat each dough round well in the powdered sugar (you definitely won’t be using all 1 ½ cups of the sugar in this step, but you’ll need the remaining sugar for later, so make sure not to throw it away at this point). Put each round on a parchment-lined cookie sheet and put in the freezer for 15 minutes. Meanwhile, preheat the oven to 350ºF / Gas Mark 4 / 180ºC, and place a rack in the upper third of the oven. Arrange the dough rounds 1-inch apart, then bake (being sure to rotate the pan half way through baking) until the cookies are lightly cracked on top and are lightly blushing with gold all around the edges, about 18-22 minutes. Once out of the oven, allow the cookies to sit on the cookie sheet for 10 minutes, then carefully transfer the cookies to a cooling rack to cool completely. 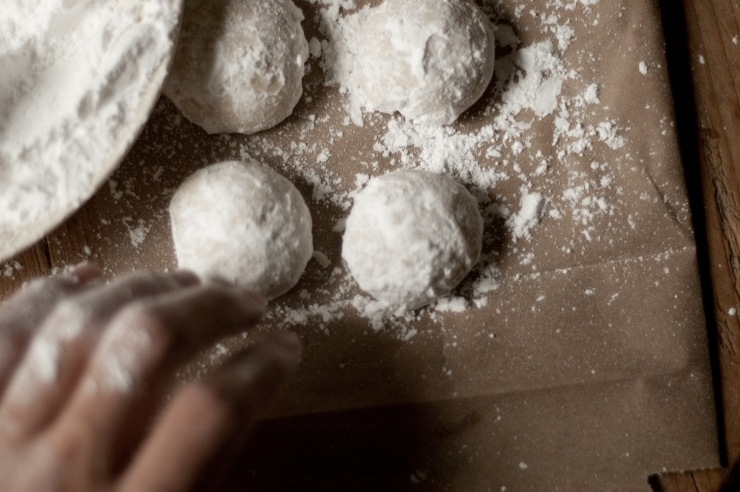 Once thoroughly cooled, roll each cookie in the remaining powdered sugar, being sure to shake off any excess powdered sugar. Storing: The cookies can be stored in an air-tight container in a cool, dry place for about a week (From my experience, each batch will probably be finished after a couple days). Stunning. Just simply stunning :) Hope you’re feeling better, Kam! These look delicious, Kam! And I love the photos. You’ve really come a long way! 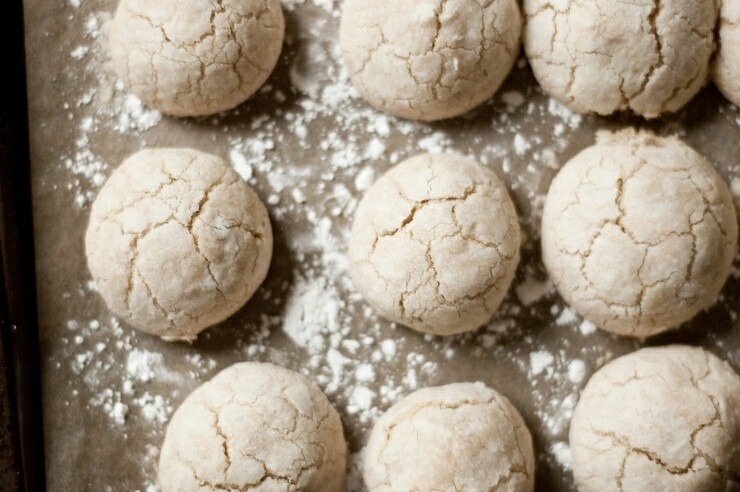 These look like Russian Tea cookies- I love making them at Christmas. Beautifully done! Beautiful pictures. I can imagine how these cookies are so much more delicious with the use of pistachios. Hmm. I’m not even sure if the saffron would come out well in the cookie with all of the other flavors, but if you do try it- I’d love to hear how it turns out with the saffron in it! These are beautiful cookies, Kamran. They remind me of Moroccan ghribah which are so good they melt in your mouth. We make something similar at Christmas and I have to hide them from my husband. I like the pistachios in this recipe and must try. As far as food poisoning, I’ve had it several times, but the worst was from a burger at Chile’s. I thought I would die, and I was out of town on a job site (decorative painting). One of the worst experiences of my life. But, I still eat meat. I just am more careful about where I eat burgers. I can feel your pain, though. It’s a traumatic experience when it’s bad. I was in SF just last month, but due to scheduling demands I couldn’t get to Tartine. Was so dissapointed. At least with these little babies, i can imagine what it would have been like. They look so short they would melt the moment they hit my tongue. Firstly: I hope you’re feeling better. Food poisoning is the worst! Thirdly: I have a couple questions regarding the recipe… I ran out of pure vanilla extract, but I have vanilla essence (the imitation stuff). I really want to make these cookies today, do you think it’ll make much of a difference. As for the almond meal: it’s really expensive around here (I live in Long Island), is there a way I can make my own? As for the almond meal, I know what you mean- I get 1lb bags of almond meal for $4 at Trader Joe’s; It’s much cheaper than other brands that I’ve seen around… If you’d much rather make your own, simply run an equal amount of almonds (in this case 1/4 cup / 20g) in the food processor until it resembles a fine sand (I push it through a sieve, to make sure there aren’t any large pieces). Be careful not to over-process the almonds, because they’ll turn into almond butter. I’ve made these cookies with toasted pecans for as long as I can remember; still using my Grandmother’s recipe today. Despite the better known association with either Mexico or Russia, in our family this cookie has always been called very simply Pecan Butter Balls and are associated with our family’s Scandinavian heritage. I’ve read that all variations originally hail from one place – that it was actually an English cookie that is the Mother of all of these sweet treats! Pistachio sounds interesting but I would have to make them outside of my standard dozens for the holidays. Our holiday tradition would not be the same without one of Grandma’s cookies on Christmas Eve! am really happy that you took the liberty to swap out some of the AP for WWPF – i use that trick quite often for exactly the same reason – it adds a bit of nuttiness to the overall flavor AND you get a tad more fiber to boot! 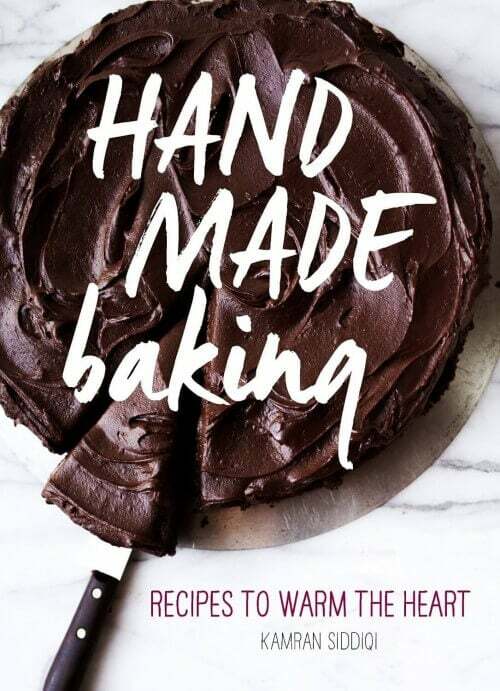 beautiful, beautiful job Kamran – cannot wait to see what happens w/your cookbook!! I have not heard of that cookie before. Would be nice to try for my cookie exchange this year. Love the shots. Have a good one!!! First, I hope your feeling better! Second, just STUNNING – the food, the photos and the writing! I actually make a Greek version of these called Kourambiedes, I make mine with pistachios too. Yours look melt in you mouth good! Hi Kam, I was going to say something about food poisoning…but I’m taking a food safety course and I don’t think it would make you feel any better lol. I was looking for finger foods to go with my tea party and these look excellent! I have tried my hand at Mexican Wedding Cakes before but they just never came out right. I will have to try your recipe! Thanks! These look delicious! They also remind me of the Greek cookie called kourambiethes! Thanks for sharing the recipe. Can’t wait to try it! These are one of my favorite cookies, the recipe sounds so perfect. I love all your photos, makes me want to learn how to really use my camera :) I’ve been pumpkin obsessed lately and made a pumpkin variety of these last week, wish we were neighbors I’d come steal some of these and bring you some of mine. Simply lovely, Kam. Hope you are feeling better! These are one of my all-time favorite cookies. When I was growing up, one of our neighbors would make them each year for Christmas (I always knew them as Russian Tea Cakes), and I would wait all year for those cookies. This year, I will be making my own. Your recipe looks perfect! Those looks so pretty and delicate! My grandmother used to make something like those around the holidays. Hope you’re feeling better, food poisoning is no fun! Mmmmmm do those little gems look divine. I would have to agree with you. 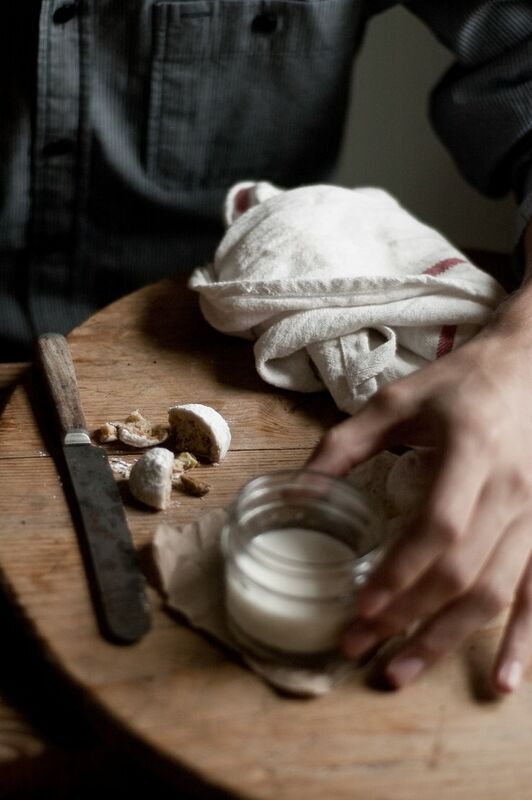 A cold glass of milk to wash a cookie down…nothing quite like it. I’ve made Mexican Wedding cookies twice from two different recipes, and both contained cornstarch. It gave the cookies a strange mouth-coating texture, so I dismissed them entirely. These seem infinitely better, I really can’t wait to make them. Thanks! I’d love to try this recipe, maybe I’ll use walnuts. Perfect for Christmas giveaways. so fun to catch up with you the other night! finally a chance to catch up on some blogs. keep in touch! These are some of my favorite cookies ever, super simple and melt in your mouth delicious. Your recipe looks great and I will definitely be trying it soon. thanks for another great post! Just recently discovered your blog, and what a pleasant discovery it is. Great images! Hi Kamran! These look delicious, but I as a Spanish gal myself I wanted you to know that it’s actually “polvorones” – no tilde needed. I have polvorones whenever I go back to Spain for the holidays. Thanks for a delicious taste of home! Made these this week for my son’s wedding. They have to be the best cookies ever! Thank you for sharing this fabulous recipe !